"Our research does give me hope that the reef can recover." 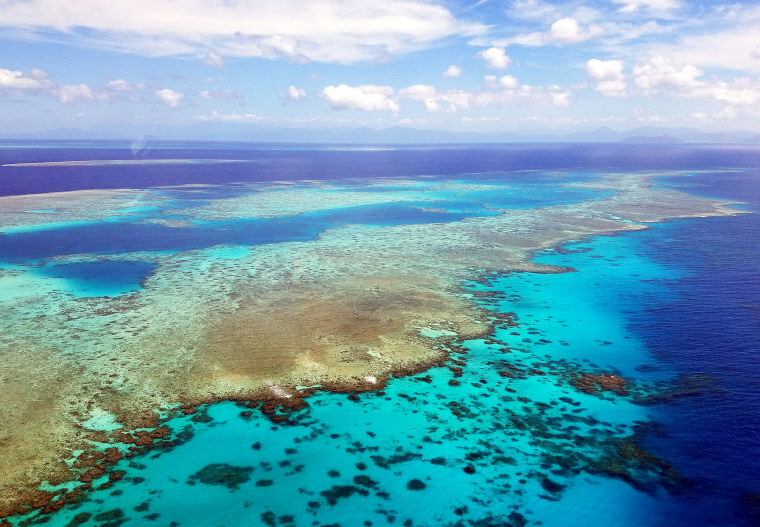 Scientists are worried about Australia's Great Barrier Reef, and no wonder. Like many coral reefs, the world's largest is under assault from water pollution, overfishing and the warmer seawater that results from climate change, among other threats. But a major new study a decade in the making shows that the reef was able to bounce back from a series of "death events" over the past 30,000 years. That suggests the reef may be more resilient than previously thought against changes in sea level and temperature — though it's highly vulnerable to poor water quality. "We discovered that the Great Barrier Reef has experienced cycles of reef death and growth over large areas in response to changes in sea level and water quality," Helen V. McGregor, a geologist and climate change researcher at the University of Wollongong in Australia and a member of the international team of scientists that conducted the study, told NBC News MACH in an email. What does the finding mean for the long-term survival prospects of the Great Barrier Reef? "Our research tells us that the reef develops in response to major changes in climate and the environment, but there are limits," McGregor said. "Exceed the limits and the reef doesn't survive. The reef can regenerate if conditions improve, but there's a catch — the reef takes time to come back." McGregor predicted the reef would become "a shadow of its former self" if steps aren't taken to rein in climate change and the other threats it faces, but said that "our research does give me hope that the reef can recover." "I have grave concerns about the ability of the reef in its current form to survive the pace of change caused by the many current stresses and those projected into the near future," Jody M. Webster, a University of Sydney geoscientist and the leader of the scientific team, said in a written statement. Webster said whether the reef is resilient enough to survive for the long term remains an open question. For the research, published May 28 in the journal "Nature Geoscience," the scientists used a variety of techniques to analyze fossilized reef sample cores drilled from 16 sites in Cairns and Mackay on Australia's northeastern coast. The analysis revealed that during the past 30 millennia there were five times when large sections of the reef died off. One death event occurred 30,000 years ago, when falling sea levels exposed the reef to air, and a similar event occurred 22,000 years ago. At these times the reef survived by shifting its position seaward and finding deeper water there. Two more death events occurred 17,000 and 13,000 years ago, when rapidly rising seas inundated the reef and drowned its coral. At these times, the reef moved landward. The final death event came 10,000 years ago, when the reef was hit by large amounts of sediment, which is known to harm coral by blocking sunlight and potentially burying it. From transplanting healthy coral onto damaged reefs to breeding hardier corals to protecting reefs with a chemical sunscreen, scientists are exploring a number of ways to help ensure the survival of the world's coral reefs. But McGregor said the key to preserving reefs is straightforward. "It's tempting to look for new strategies to protect the Great Barrier Reef, but quite frankly we already know what to do: maintain good water quality and reduce [carbon] emissions to limit ocean temperature rise," she said in the email. As for whether the new study offers a measure of reassurance to those who worry about the world's reefs, Stuart Sandlin, a marine ecologist at the Scripps Institution of Oceanography who wasn't involved in the new research, offered his own assessment. "You will find coral reef professionals who are vehemently on one side of the fence or the other of optimism or pessimism here," he told MACH in an email. "This study, however, reminds us not to forget that although we are seeing many examples of coral reefs dying, there are phenomenal examples of coral reefs growing that we can draw hope, or at least perspective, from." Coral reefs are valuable for many reasons. In addition to providing habitats for marine organisms and helping protect coastal areas from storms and wave action, they're often of vital importance to the tourism and commercial fishing industries. The Great Barrier Reef extends more than 1,250 miles along Australia's northeastern coast and covers an area of roughly 135,000 square miles. It's home to more than 1,500 species of fish, 30 species of whales, dolphins, and porpoises, as well as many species of sea turtles, birds, and snakes. It was designated a World Heritage site in 1981.